An illustration made for "Darksiders: Your Last Days" Contest, held at Deviant Art. After the Apocalypse, a few men crawl out of their shelters to look for survivors and to see what was left after The End came. 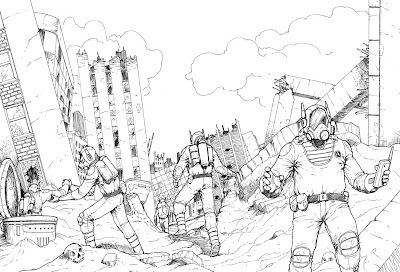 The enginner on the right is trying to find any kind of signal to communicate through his device; the two scientists on the middle, walking away, are going to explore a bit; the man on the left his helping the leader of this community getting out; the leader is dying and wishes to see the surface once more before passing away.